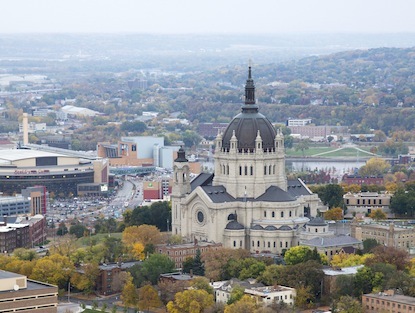 See the Sacraments page or Faith Formation page for details about celebrating the sacraments at the Cathedral of Saint Paul. Open to young people and adults, servers assist the celebrating priest during liturgies. Servers are scheduled twice monthly. This ministry involves reverent distribution of the Eucharist at the Sunday Mass of your choice. You must be a member of the Cathedral parish and a Confirmed Catholic. Extraordinary Ministers of Holy Communion are scheduled twice monthly. Greeters offer the gift of hospitality to those who enter the Cathedral doors. Individuals or entire families serve as greeters at Mass and other Cathedral events. Greeters are scheduled one to four times a month at a Mass of their choosing. This is the ministry of proclaiming the Scriptures at the Holy sacrifice of the Mass. You must be a member of the Cathedral and a Confirmed Catholic. Lectors are scheduled approximately once a month. Volunteers operate the soundboard used for the broadcast of the Sunday 10:00 a.m. Mass over Relevant Radio 1330 AM. The homily from the Mass is recorded for posting on the website. After training, operators work one Sunday per month. These volunteers assist with the ongoing care of the chapels and changes in the décor of the church for the various special liturgies and liturgical seasons. Volunteers operate the sound system for the church to provide an optimal listening experience in this challenging acoustic during Sunday Masses and other liturgies as needed. Cathedral ushers welcome parishioners and visitors and attend to their comfort and security. Ushers also take up the collections and assist the sacristan. 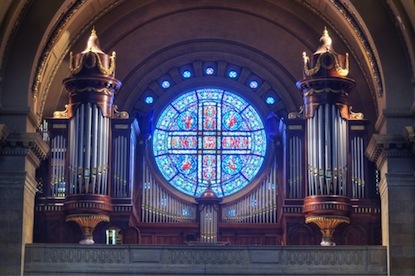 See our Sacred Music section for information about our Sacred Music program, including our choirs, concert series, pipe organs, and more. BeFrienders are lay volunteers who provide pastoral care to people in difficult and transitional situations such as illness, loneliness, or loss of a loved one. The skills the BeFrienders learn in training allow them to respond with compassion to those in need and thus serve as a living reminder of God’s love. The Funeral Lunch Committee provides hospitality for families scheduling lunches in Hayden Hall after a funeral. There is no cooking or baking required. Couples preparing for marriage utilize a marital inventory to help them understand the differing ways that each of them views situations within marriage. It helps them to focus on the core issues of their relationship. The mentor couple facilitates a discussion between the bride and groom, affirming those areas in which they agree with each other, and exploring areas in which they see differently and may need further discussion. This committee supports those discerning God’s call to the priesthood or religious life. The Traveling Chalice program encourages parishioners to say daily prayers for vocations and helps to foster openness to these vocations within the home. The Divine Mercy Cenacle meets weekly for fellowship and to study the Diary of Saint Faustina, the Sacred Scriptures, and the Catechism of the Catholic Church. This is followed by Divine Mercy Chaplet in the Adoration Chapel and Benediction. The Cathedral Council, founded in 2008, focuses on the application of the principles of Knights of Columbus and the study of Church documents to “build a culture of life.” It supports pro-life organizations through volunteerism and fundraising, including University LifeCare Center, Little Sisters of the Poor, Special Olympics, Birthright, and Prenatal Partners for Life. The Ladies Auxiliary Council is a group of ladies of all ages and backgrounds with a common interest in pursuing the mission of “building a culture of life.” This mission is relative to all phases of life and is fulfilled through prayer, catechesis, service, and community. The Ladies Auxiliary supports the Knights of Columbus with their service and community activities as well. The Men’s Association invites men of the parish both to spiritual growth through reflection and to service of the parish through various events, retreats, fundraisers, special projects, and hosting Coffee and Donuts Sunday monthly. The mission of the Moms’ Group is to help mothers find Jesus Christ in their daily lives, help them connect their maternity to God’s calling for them and their families, and to help them support the domestic Church. Most events focus on nurturing mothers, while occasional large events include the entire family. The Women’s Association is a faithful group of women from the parish who provide an opportunity to come together in friendship, service, and hospitality. Annual events include a Christmas cookie sale, lemon pie sale, an annual tea around Saint Valentine’s Day, a Lenten retreat, and the Giving Tree project. They also host Coffee and Donuts Sunday monthly. The purpose of the Young Adults is to draw men and women (ages 18-39) into a deeper relationship with Jesus Christ and to support each other in this effort through various activities and events. Faith is the foundation of our being; Communion is our way of being; Mission is our reason for being. Assist the Archivist in cataloging, displaying, and properly storing items of historical significance to the Cathedral. This includes work with documents, books, audio/visual products, oral histories, and artifacts. Records are maintained to provide accessibility for research. The Cathedral Museum, staffed by volunteers, provides an opportunity for visitors to see and appreciate historic pictures and artifacts that are significant to this grand Cathedral. The Museum is typically open on the first and third Sundays after morning Masses, and Monday through Saturday from noon to 3:00 p.m. 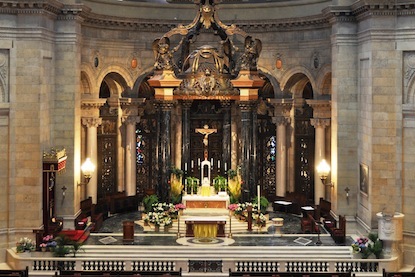 Guides lead tours that focus on the history, art, and significance of the Cathedral as the architectural presence of the Catholic Church in the larger civic, social, and business community. Regular public tours are scheduled every Monday through Friday at 1:00 p.m. (except holidays and Holy Days). Private group tours are available by request. This group arranges interviews with long time parishioners and neighbors, recording and transcribing many stories about the Cathedral’s history from a personal, first-hand perspective. The following are advisory groups to the Rector. The Pastoral Council is composed of both appointed and elected members; the Finance Council is composed of appointed members only. The Cathedral of Saint Paul’s Parish Council serves as an advisory body to the Rector, providing input and advice on a range of parish matters. The members are drawn from various standing parish groups and committees, as well as from the parish membership at large. The Parish Council assists the Rector in ongoing planning and implementing the parish’s mission. 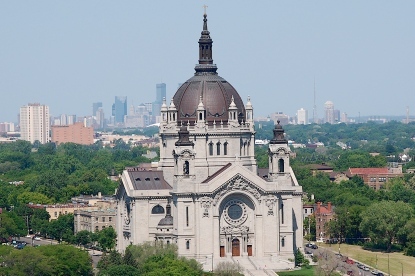 The Parish Finance Council is an advisory body required by and established under canon law to consult with, advise, and assist the Rector of the Cathedral of Saint Paul on a broad range of parish financial matters, including budget planning, investment, accounting, project financing, and endowment use and management, among other matters. Volunteers are responsible for a chapel or shrine, tending to general cleaning and floral care, as well as reporting repair issues or other concerns to the staff. Thorough cleaning prior to Christmas and Easter will help keep our Cathedral shining. Men, women, and children of all ages are encouraged to help out. Please joins us for our annual fall cleanup of the Cathedral grounds starting at the conclusion of the 8:00a.m. Mass on Saturday, October 20. Please bring rakes, electric or manual clippers, brooms and small wheelbarrows to help with the work. Meet in the Cathedral's rear yard on Selby Avenue. 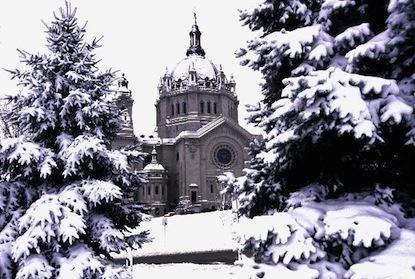 The Cathedral will supply warm coffee and baked treats for those who help out with this important work of keeping the Cathedral grounds beautiful. Help to organize our annual community-building event. Duties include monthly planning meetings, contacting business partners, and scheduling volunteers to staff a wide variety of activities. It’s a great opportunity for large event planning experts. Beautify church grounds by maintaining and planning flowers, shrubs, and any other greenery in the spring, summer, and fall. Cooks meals and provide hospitality for several receptions throughout the year. The are several activities by which we seek to advance the Gospel call to bring charity and justice more fully into the lives of our neighbors in need. Parishioners volunteer for Project Home in the winter, when our lower level becomes an overflow shelter. Others volunteer with Habitat for Humanity during the summer or at Dorothy Day throughout the year. Maintain supplies, equipment, and upkeep of the Hayden Hall kitchen and pantry. Experts with marketing and public relations backgrounds help develop and establish various tools to promote awareness of our Shared Mission. On Mondays at 8 a.m., work in a group of detail-oriented individuals to accurately count the weekend collection. Welcome new members. Meet for Mass and offer fellowship before or after. Work on time-sensitive projects with only a few days notice. Beautify the Cathedral interior to coordinate with liturgical seasons. Hang banners and decorations, care for floral arrangements, and arrange furniture in the nave, sanctuary, and chapels. Staff the Welcome Table after weekend and Holy Day Masses. Welcome new members, provide information, and answer questions.